“It’s cold up here in Minnesota!” says Acucraft Owner Chris Maxson. That’s why Acucraft Fireplace Systems, based in Big Lake, Minnesota, has been manufacturing and perfecting wood fireplaces for over 39 years. 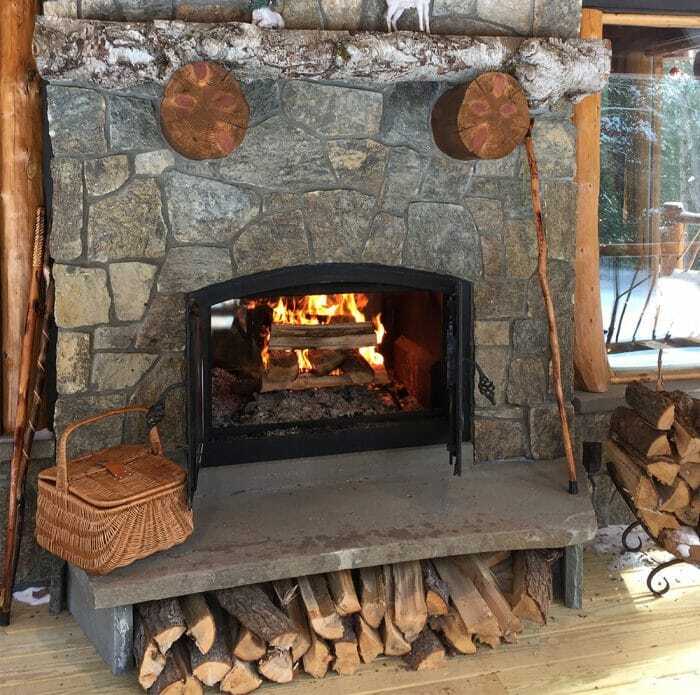 We have tested hundreds of wood-burning methods to create the ultimate wood-burning experience. Nothing compares to the warmth of a crackling fire, the smell of a wood-burning fire and the comfort and ambiance a wood fireplace creates. In addition to this enjoyment are the benefits of a reduced heating bill—as long as your wood fireplace is burning efficiently and performing to its potential. The wood you use in your fireplace impacts your heat output. Use dry hardwood, such as oak or maple, with a moisture content between 18-22%. Wood moisture meters can be purchased for under $25. Wood with high moisture burns less efficiently, produces less heat, and can create creosote buildup. To achieve quality, dry firewood, you’ll need to cut the wood to length; split the wood; and store it. Splitting your firewood is important for it to dry properly. Split logs to less than six-inches in diameter. Then store the firewood in a dry place like a shed or under a tarp for a year to let it season. If you are storing your wood under a tarp, uncover the wood during summer months so the sun and wind can dry the wood. In arid regions, your wood may dry in less time, depending upon your weather, climate and type of wood. The wood you use in your fireplace impacts your heat output. Use dry hardwood, such as oak or maple, with a moisture content between 18-22%. Many people believe they need to use a grate with their wood burning fireplace, but many grates raise the wood too high and create too much elevation which lowers the fire temperature. Instead of using a grate, place your dry hardwood logs directly on a one-inch layer of fireplace ash at the bottom of your firebrick. The ash will provide enough elevation for the dry hardwood logs to breathe, and the ash will insulate the coals. Ash at the bottom of your firebox also maintains red hot coals that will slow down the fire burning rate and increase burn time so your fire will burn hotter and last longer. When the fireplace ash exceeds the depth of one-inch you can remove the excess before starting your next fire. The ash at the bottom of your firebox is necessary for maintaining red, hot coals to slow down the burning rate and increase burn time. Outdoor air temperature impacts chimney drafting and how well your fireplace performs. Cold outdoor air is lighter and travels faster, so fireplaces burn hotter and faster. Warm outdoor air is heavier and travels slower. Knowing this, you’ll need to adjust your combustion air controls to help your fireplace perform to its best. During warmer seasons, open your combustion air controls more fully, up to 100%, to allow more air in. During colder seasons, close the combustion air controls to about 50%. This will reduce airflow to your fireplace and help keep your fireplace glass cleaner. Not all chimney systems draft exactly the same. So when you notice your fireplace burning too fast or not enough, just adjust your combustion air controls to discover what settings work best for your wood fireplace. Outdoor air temperature affects chimney drafting. Open your combustion air controls more during warmer weather and close to about 50% during cold weather. Acucraft highly recommends that you have your flue professionally inspected and cleaned every year to remove creosote buildup and to ensure that your fireplace is performing safely. The most common causes of creosote buildup are burning soft, moist, or wet wood and using newspaper as a firestarter. Safer choices are using wax and sawdust firestarters, and they work great with kindling. If you use your fireplace often, use a creosote spray a few times per wood burning season to minimize creosote buildup between chimney sweeps. A creosote spray will not replace the need for an actual chimney sweep with a brush, but will help to maintain a cleaner fireplace and chimney system. In addition to having your fireplace professionally inspected and cleaned, you’ll also need to perform maintenance on your fireplace. Call Acucraft toll free (888) 317-6499 and talk to a member of our Service Team to order a Acucraft Wood Care Kit for your fireplace or email info@acucraft.com. 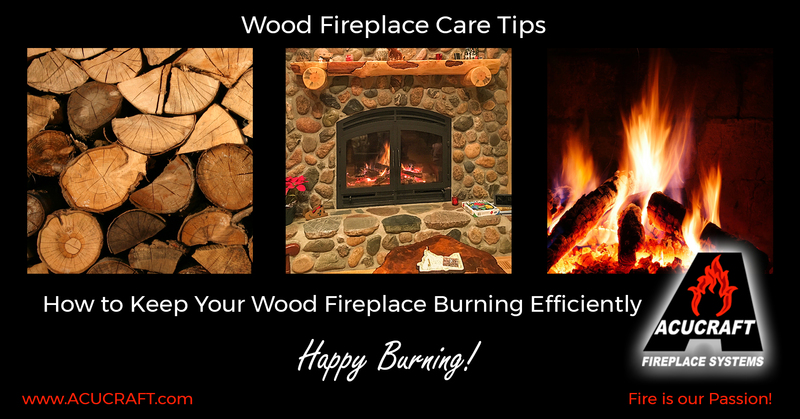 When you take care for your wood fireplace, it can warm you for a lifetime of happy burning and save you money in the process.